, a dissenting writer of the last century, was born in Southwark, where his father was an undertaker, and of the Calvinistic persuasion. Under whom he received his classical education is not known. In 1746 he began to attend lectures, for academical learning, under the rev. Dr. David Jennings, in Wellclose square, London. Soon after, leaving the academy, about 1752, he was, on the rev. James Read’s being incapacitated by growing disorders, chosen as assistant to officiate at the dissenting meeting in New Broad-street, in conjunction with Dr. Allen; and on the removal of the latter to Worcester, Mr. Palmer was ordained sole pastor of this congregation in 1759. He continued in this connection till 1780, when the society, greatly reduced in its numbers, was dissolved. For a great part of this time he filled the post of librarian, at Dr. Williams’s library, in Red- Cross-street. 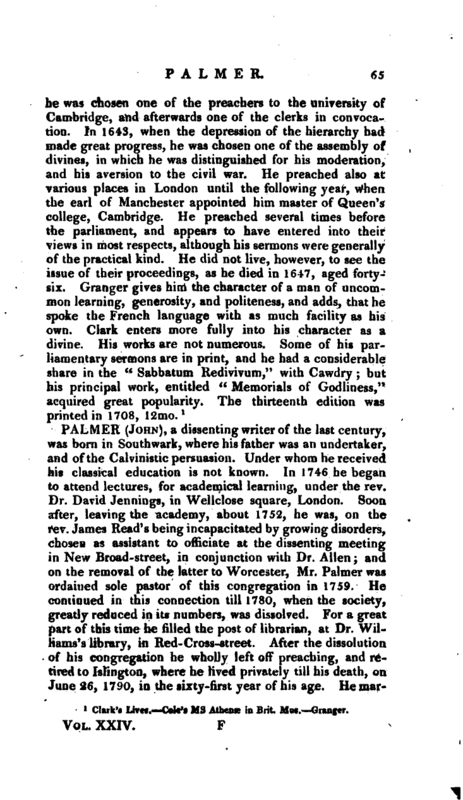 After the dissolution of his congregation he wholly left off preaching, and retired to Islington, where he lived privately till his death, on June 26, 1790, in the sixty-first year of his age. He | married a lady of considerable property, and during the latter years of his life kept up but little connection with the dissenters. He was a man of considerable talents, and accounted a very sensible and rational preacher. His pulpit compositions were drawn up with much perspicuity, and delivered with propriety. He allowed himself great latitude in his religious sentiments, and was a determined enemy to any religious test whatever. Tests, indeed, must have been obnoxious to one who passed through all the accustomed deviations from Calvinism, in which he had been educated, to Socinianism. Life by Mr. Toulmin in Monthly Mag. 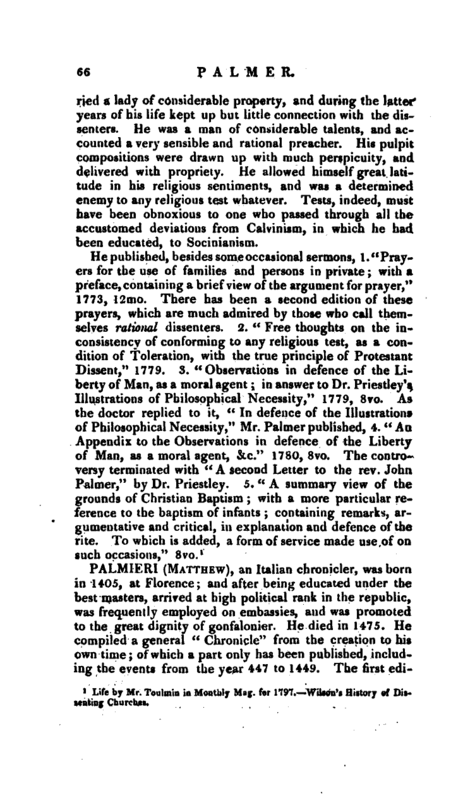 for 1797.—Wilson’s History of Dissenting Churches.